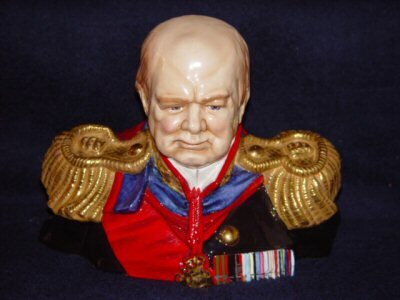 Michael Sutty�s bust of Winston Churchill in the uniform of the Warden of the Cinque Ports is made of fine bone china and sculpted in exquisite detail. A limited edition of 250, this piece is #12 and is in perfect condition; 8 inches high x 10 inches wide. Michael Sutty Ltd. of London, England, is no longer in production; therefore, the issue number for this piece will not be filled. Fewer than 75 of this piece were made, which makes it rare and highly in demand. No charge for shipping within the Continental USA.